If you are involved in a dispute with a tax authority, you need an experienced attorney to protect your interests. The consequences can be serious, including fines, penalties or even jail-time. You want a lawyer with the experience, skills and knowledge to recognize all the potential issues, a lawyer who has successfully helped others in similar circumstances. 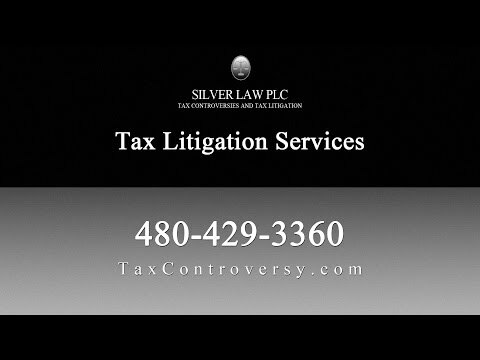 At Silver Law PLC, in Scottsdale, Arizona, our attorneys have more than 80 years of combined tax law experience. We handle a broad range of tax controversies for individuals and businesses throughout Maricopa County. We have a comprehensive understanding of the litigation process as well as substantive tax law. To set up an appointment, contact our office or call us at 480-429-3360. We represent individuals and businesses involved in litigation with local, state or federal tax authorities. We have handle tax claims in the state and federal courts in Arizona, as well as the U.S. Tax Court and the United States Supreme Court. If you face criminal tax charges, including allegations of tax evasion, we can protect your interests during the IRS investigation, as well as grand jury investigation. We will represent you if you have been contacted by a special agent as part of a criminal investigation (whether you are only a witness or are the subject of the investigation). We will handle all aspects of your criminal defense, including an investigation of the facts of your case, the gathering of evidence, requests or motions to exclude improperly obtained evidence, plea negotiations, and the criminal trial and appeal. We use former special agents as our private investigators and customarily coordinate our efforts with forensic CPAs so that we can mount the best defense for your situation. To set up an appointment, contact us or call us at 480-429-3360. We are available to meet with you weekdays from 9 am until 5 pm. Evening and weekend consultations are available upon request. We are located in Kierland.